Coastal dredging is vital to maintaining New Jersey's marine transportation system, which provides access for recreational boaters, commercial vessels as well as the transportation of people and goods. There are many different methods utilized in the dredging process, however, the basic principle consists of removing sediment and accumulated debris from the bottom of navigation channels and waterways and placing the material in an approved location. 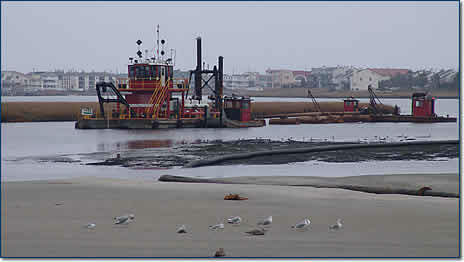 To support the estimated $50 billion maritime industry and maintain safe and navigable waterways, the NJDOT Office of Maritime Resources conducts maintenance dredging projects throughout the State, with the exception of federal channels including the Intracoastal Waterway, which is maintained by the U.S. Army Corps of Engineers.